I’m on a family vacation at the moment, with my parents and my little (grown, adult) sister. This may not come as a surprise, but it is NOT like the childhood trips I remember, with the whole gang (all six of us) piling in the car and going to Kiawah Island for a week of beach time (umbrella time for yours truly) and alligator spotting. Things have changed over the past few years. My sisters have gone off to start their own families, with their own vacations, and our overarching family dynamic is shifting. But change can be fun! We can all have happy hour together now! And eat fancy food. And split up when we want to, because the internet is pretty rad and will make sure we all get home! So on this “grown adult trip,” as I like to call it (which is ironic because I definitely still take selfies with my sister as soon as she falls asleep…) I’m showing off my favorite nooks of Portugal, and then we’re all heading to Spain. And guess what? You get to follow along right here! If all goes according to plan, I’ll have beautiful pictures, wonderful memories, and some helpful hints for family trips, all to share with you! If all doesn’t go according to plan, I guarantee a few sleeping selfies with Mariah (little grown adult sister) and some good coffee shop recommendations. Things could be worse. So let the adventure begin! My little (grown, adult) sister, Mariah, arrived a few days prior to my parents, for a surf camp in town. Naturally, on the same day, Kris’ wonderful mama came to stay with us for a bit, so there was plenty of excitement to be had in our little elf house. I scootered over to meet Mariah (because I can scooter now! Wahoo!) as soon as her feet touched the ground in Ericeira, and we went for my favorite stroll around town. My "go to” route is over the rocks, by the water, and ends with a Pastel de Nata from Maria’s bakery. Over the next few days, Mariah settled into her surf camp, and I met up with her in the afternoons for coffee, adventures, and… food! Oh, and I wound up being sick and discovering the Portuguese public health system in the middle of all of this as well. But it was no big deal! Mariah was off making friends, doing her own thing, and learning to surf like a boss! Or like a boss’ assistant. As luck would have it, I also scheduled a dinner club when Mariah and Kris’ mama were visiting, so everyone got to meet everyone, I guess you’d say. There’s nothing better than watching the people you love, meet the new people you’ve come to love, all over delicious food and wine. My heart is so full with the friends who’ve taken me in, in my new town, and it’s nothing short of wonderful to have part of my family here to experience the sense of community I’ve found in Ericeira. This stunning, cliff-lined spot is the western-most point in Europe, and is 100 percent a tourist trap that I recommend falling into… for ten minutes. The views are beautiful, and the drive there is “oh my gosh!” out every window (take the scenic route along the coast). 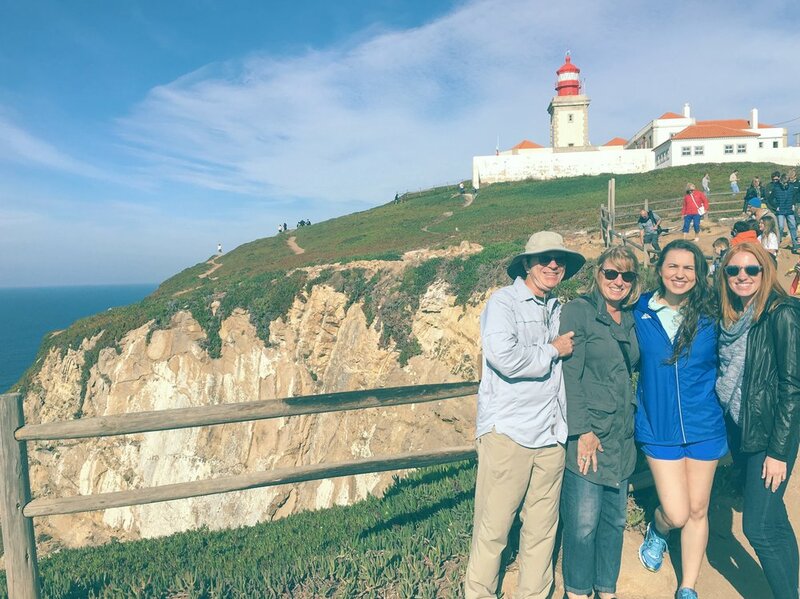 We walked along the nature-laden paths, snapped some pictures, and then headed back to one of the tiny roadside restaurants we passed on our drive to Cabo da Roca. Now this is where the magic happened. We didn’t have big afternoon plans, but the sun was shining and the outdoor tables at Refúgio da Roca were calling our name, so we (ahem, my dad) parked the Fiat up the road, and meandered our way to this restaurant brimming with character, and staffed with characters. We wined, we dined (get the shrimp!) and soaked up the sun before heading home. By no means was this the best cuisine I’ve ever had. Anything along the main road to Cabo da Roca will be a bit “commercial” if you will. BUT the service, atmosphere and overall experience of this roadside stop, was something I’ll remember for a very long time. This is the spot where my parents fell in love with Vinho Verde, where Mariah and I discussed sucking the heads off of massive shrimp (is this a thing y’all do? I’m unconvinced) and where we just… relaxed. For awhile. We experienced more of Portugal in the few hours at this restaurant, than you’d experience on any Hop On Hop Off tour, packed with famous sights. And in my opinion, it’s the perfect testament to why I love this new life of mine so much. If I can borrow a phrase from the Italians, it’s the “sweetness of doing nothing" that comes alive in quaint, European towns. And I feel oh-so-lucky to share this “nothing” with the people who gave me everything. Stay tuned as the four of us continue to Seville, Granada and Lagos. I’ve only ever been to northern Spain, but I’ve heard the south is brimming with delicious tapas and stunning landscapes.